Welcome to DigitalAquatics Underwater and Nature Photgraphy! 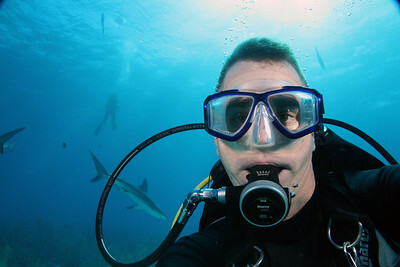 DigitalAquatics came as a fruition of my passion for photography, scuba, and the beauty of nature and the outdoors. Photography has been a hobby of mine off and on since I was just a kid. I started out using my father’s 35mm SLR. In high school I took one semester of photography, however most of what I have learned has been from trial and error and just getting out there and seeing what works. I have worked with standard 35mm SLRs and have since progressed to the digital realm. I love the purity of 35mm film, but relish the freedom and diversity using digital media can provide. I have always preferred nature and animals as my subject matter and once I started diving, it was just natural to carry over my interest of photography to the underwater realm however I have remained true to my affinity for the entire natural world. I think the thing I like most about nature photography compared to portraits or people, is that it can’t be faked. Nature does what nature does and it never “poses” for you. I truly hope you enjoy and are inspired by my work, get out there and enjoy the world we live in! I am always taking more photos, so check back often for new galleries!